Israeli President Reuven Rivlin met on Tuesday morning with Christian leaders, including Patriarch Theophilos III, in the Old City of Jerusalem. The meeting was organized to mark the Easter holiday, and was the first held by a sitting Israeli President at the site in 30 years. Rivlin used the opportunity to reaffirm his commitment to defend and promote equality and religious freedom: “For me, attacks on your holy places is as damaging as those onto our holy places, and it shouldn’t happen” he stated. “The close relationship between Passover (Pesach) and Easter (Pascha) is an important reminder to us all, of the deep bonds that unite the children of Abraham. Jews, Christians, and Muslims have lived here side by side for centuries, always seeking mutual understanding, for the mutual well-being in our region,” he said. “We must lament the slaughter of Christians in the presence of the indifference of world leaders. We hope and pray that God will impart peace on our peoples in the Middle East, and across the world,” said the Latin Patriarch. 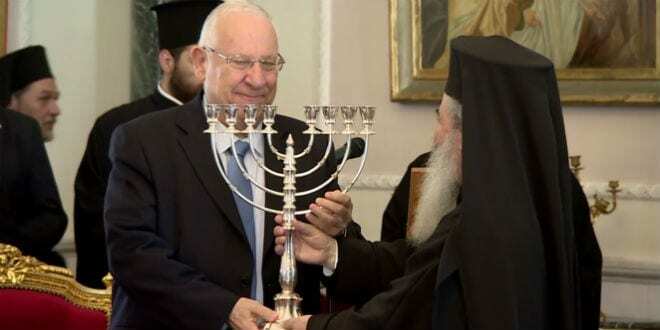 Following his address, the Greek Patriarch presented President Rivlin with a beautiful Menorah, and a copy of the ethical classic, “Duties of the Heart”, by the 11th Century Jewish philosopher, Rabbi Bachya Ibn Pakuda. Rivlin presented the Greek Patriarch with an engraving of an ancient coin from Jerusalem.